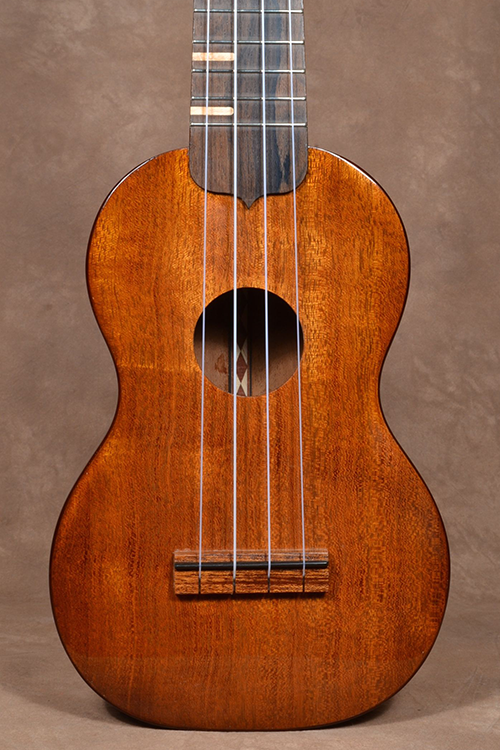 This is a nice light, sparky and simple little soprano ukulele that really punches out the tunes. It’s super responsive and ‘sparky’ just the way an excellent soprano instrument should be. I put just enough adornment to make the ukulele interesting but have it still remain simple. There is the wooden inlaid ‘deco keystone’ in the peg head, the back of the peg head has an interesting contrasting elm burl veneer which looks great with the peg head tuners. The tuners are the planetary geared 4:1 ratio tuners which make the ukulele easy to play in tune. The finish is a smooth glossy lacquer on top of the Honduran Mahogany and the edges are sprayed with a subtle amber & tobacco color sunburst. If you're a fan of the little soprano instrument this is an excellent players choice. Small, tidy & delicately perfect. It’s overall length is about 21” and weight is approximately 12.5 ozs. The instrument comes in a hardshell case.